BLACKHEARTS is a documentary that tells the compelling story of three die hard fans of black metal. The hard rock subgenre gained worldwide notoriety because of its links to Satanism, church burnings and murders 25 years ago in Norway. We follow Sina from Iran, Hector from Colombia and Kaiadas from Greece on their journey to Norway - the Mecca of the music that has formed their lives. What makes someone risk their life, get thrown in jail or sell their soul to Satan to make this dream come true? Sina is the only active black metal artist in Iran, and face a potentially life-threatening situation if he choose to follow his dream and travel to Norway. Hector is a devoted Satanist and organizes a satanic ritual to sell his soul to the Devil in order to help his visa application. Kaiadas represents the extreme right-wing party Golden Dawn in the Greek Parliament by day, and is the frontman of the black metallers in Naer Mataron by night. He faces up to 20 years in prison after being arrested for association with a criminal organization. Many films have documented the history and development of black metal, but BLACKHEARTS looks at this infamous genre from a fresh new angle. The film recounts three very different personal stories of dedication, ambition and expectations following the journey of the main characters. 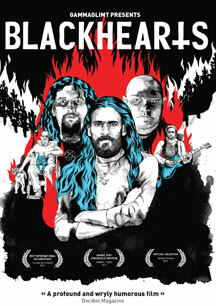 BLACKHEARTS was awarded Best International Documentary at the Sound On Screen Film Festival 2016, and has been given much praise for its unconventional and observational approach to its subject matter. This is an unfiltered view behind the veil of imagery and myth that surrounds this genre. The scenes are at times funny and surprising, and at other times surreal and disturbing. They show the extent to which humans are willing to go in pursuit of what they believe in. The DVD is packed with bonus features! Features music by bands like Burzum, Gorgoroth, Myrkskog, Manes, From The Vastland, Naer Mataron, Luciferian and more. Appeals to a wide audience and requires no interest or knowledge of black metal. Screened at festivals and events all around the world prior to the DVD release, among other places in Chicago, New York and Buffalo in the USA, Norway, Portugal, England, Colombia, Finland, Romania, Australia, Argentina, Sweden, Mexico and South-Africa. Blackhearts is not a traditional ‘music documentary’ tracing the development of Norwegian black metal, but is an observational film where we see the development of the main characters as they journey to Norway. Blackhearts is not a traditional 'music documentary' tracing the development of Norwegian black metal, but is an observational film where we see the development of the main characters as they journey to Norway.